Here’s something fun for kids and adults. plasq, the maker of the very popular Comic Life, has released an application for the iPhone, Comic Touch. I recently heard Keith Lang of plasq talking about it on the podcast MacJury. I was curious to see how it would work, skeptical that it could do much on such a small screen. OMG, it’s great! You can take a photo with the iPhone and turn it into a little comic with speech balloons, thought bubbles, and captions that look like real comic book stuff. 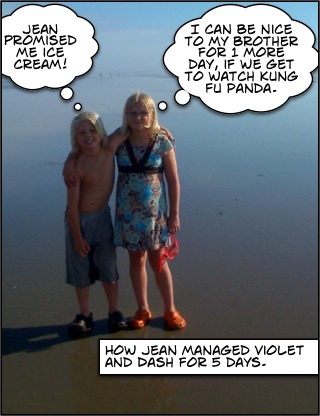 I created the little one below with a photo from Camp Jean in about two minutes–without having to read a manual. You can also use photos from your iPhoto library. Special effects are available. Best of all: you can email the finished product in a couple of taps! I wish I had this while we were on the trip–I could have sent some funny stuff back to my sister and brother-in-law. As a geek, I’m excited by this glimpse of how cool the iPhone can be. As an aunt, I know this is going to earn me lots of cool aunt points! Comic Touch is $4.99 at the iTunes App Store. This is so much fun! I should have known it would be because I love Comic Life…still a little skeptical making the transition from traditional apps to iPhone/iPod Touch apps….skepticism slowly receding though.